It is my first trip to Charlotte. My original purpose here was twofold. The weekend would start with a speaking engagement and end with my son Michael’s first NFL game. Instead, I arrived a few days short of the engagement, in time for Michael’s ACL surgery. Ten days earlier, he had run down the field on a kick off. No contact. Pop. Sky. Sideline. Waiting for him in recovery had me thinking about the wax and wane of this game and of life in general. Here in Charlotte, I can see the stadium from my son’s new apartment. Life goes on outside his window. The Midnight Diner is 24 hours a day hopping. Yet, in here, we are in rehab mode. Our world is in 2 hour motion and ½ hour ice rotations. Our days are marked not by hours, but by progress. Sunday was confirmed when early morning tailgaters began to flood the parking lot in front of our building. I watched them erect their flags, unfold chairs and fire up grills. A single wall separated Michael from their pre-game rituals and inwardly I acknowledged the symbolism. Close to kick off, I decided to venture out and get a feel for Charlotte on game day. Sunshine, Barbecue, Burgers, Beer and a Live Jazz band set the rhythm. I fell into the easy going movement of Cam Newton and Steve Smith Jerseys heading towards the stadium. It was an odd feeling, knowing that I should already be inside. That Michael should already be dressed. Odd, but not angry. Once, years ago, I was going through a rough time. It was weighing on me and I wore it on my sleeve. My dad saw it and what he said was simple. His intention was to provoke me and it worked. “Kid, he said with a smirk, it’s just not your time to shine.” He was making fun of me. He wanted me to know he didn’t feel sorry for me. He challenged me to turn things around, myself. It made me think about Michael and how he is handling everything. When he first called home with the news, there was a slight pause in our talk and he filled it by saying, “Ma, I got this.” And so it seems, that it is on the sideline, where will is tested and resolve is defined. The sideline is a temporary state that reveals our nature. Those who turn to stone become the very weight that holds them to the line. Those who sit are out of sight/out of mind and soon forgotten. Those who build walls will remain trapped on the other side of them. Those who shrivel in their own insecurity, concede. Yet, those who keep their helmets on and chin straps fastened, who flirt with the edge of the yellow line, who remain in the game and in the heads of their teammates, who constantly prepare for their return and have the resolve to remain steadfast until it is time to again take the field, these are the men that will impact the game and in turn, impact lives. Each night in Charlotte I run through the peaceful city and finish at the stadium. It’s all locked up. For me, standing on the other side, looking in, is metaphorical. I look through the windows at the murals, the NFL logo that consumes the entrance of the suites, the football made of steel suspended from the ceiling, the slice of field and sliver of goal post that I can just see through the metal gates. I stand under each of the four massive Panther sculptures and appreciate their claws gripping the edge of the stone. My final stop each night is to the statue of former Carolina player and coach, Sam Mills. He is beautiful, proud and strong. Underneath the strength of him reads, A Leader and Gentleman. After a week of visits, I mentioned him to my son. “Oh yeah, he said, “Sam Mills is everywhere. His message is everywhere in the stadium. 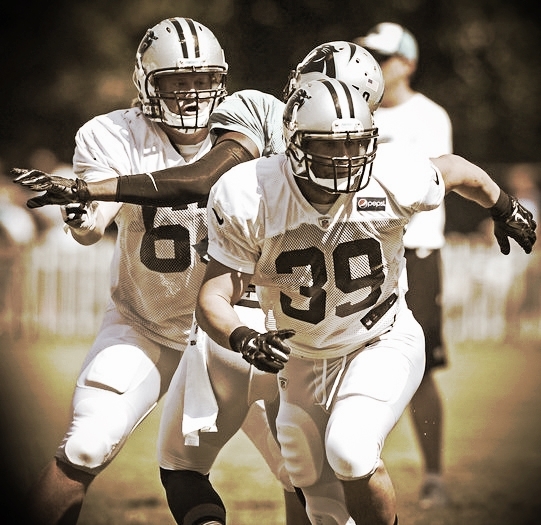 KEEP POUNDING.” It was incredible to me and once I read more about Sam Mills, he became incredible to me. I learned that he said those words to the 2004 Panther team before their playoff game against Dallas. I learned that he shared those words while battling a cancer that would inevitably take his life at 45. I said them over and over again and I continue to say them. KEEP POUNDING. KEEP POUNDING. How ironic, for it’s just about the best thing anyone can hear when they’re sidelined. It makes me grateful to Sam Mills for his message and grateful to the game for the inimitable lessons I continue to learn from it.